This was my headgear for answering the door at Halloween, asking friendly metaphysical questions concerning identity, "What (or who) are you?" while dishing out candy to children in outfits. 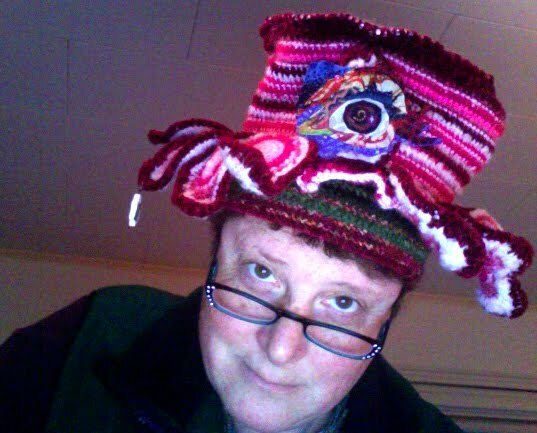 (Hat by the amazing Syd Rhoads of WendyBird Hats soon to be on Etsy--I added the fabric eye, temporarily, to make me look more discerning). There's no hesitation about answering: "A witch!" "A hockeymask monster!" Funny no one ever answers, "A kid in a costume." A while back a sort of obvious realization gave me belly laughs followed by a zingy bubbly energy that wouldn't sleep. I can't quite remember now what struck me as so funny about it, but I'll give it a try. This thought "I" elaborates itself out into endless flourishes and intricacies, but it's all coming from the same root. Before adding "am..." and all that follows, there is only that one "I" thought, pretending in each person to signify a unique and separate reference of experience. Something like 75 trillion cells make up a human body. There's almost 7 billion of these aggregates of cells on the planet. Every one of them (give or take) calls themselves, in whatever language, "me" or "I." I never quite saw before that in each one the same "I" idea lives. This "I" thought that our lifeform hosts and serves, that we believe in as our very own, it's everyone's. Such a laugh! Joke's on 'me'. There are 20 times as many bacteria, with their distinct genes, living in each human body, as there are mammal cells. (More about that here). Do we count them in as "I" too? So, aside from a chuckle (perhaps) what's the benefit of this awareness? For me, it gives an instant's break from all the striving and effort to maintain, track, update and improve the I-identity, through everything "I" do or don't do, think, feel, etc. When 'I' is seen as only a concept, one shared by everyone, simply a mental artifact--it lets us off the hook. There's nothing to do or be. Just for now. Breathing happening, reading happening. No one here! Just an idea-someone. And yet...there's still this lifeform, and what animates it. Who's that? Who's still here, unidentifiable, laughing?